Welcome golfers to our web site. Enjoy a wonderful week by participating in our golf trips to Myrtle Beach in Spring 2019. You can register now. Indoor golf lessons at the end of April: Click here. Register for our newsletter to be informed about our upcoming activities. To see and review a golf movement is the key to success. With these videoclips (French version only), Michel Grégoire gives you the opportunity to better understand the various techniques of golf. You can view them again and again! Offer a gift certificate to your friends and loved-ones! 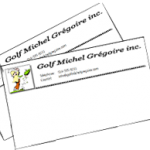 Whether to initiate your partner of refine the golf game of a friend, a gift certificate from Golf Michel Grégoire is the perfect idea. 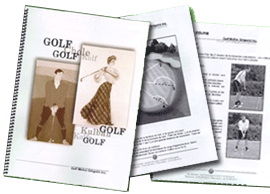 Golf certificates are applicable on all our services and packages. Written by Michel Grégoire, this manual (French only) illustrates several key elements to help improve your game. It is a handy reference guide to own. This is a must and available for only $15.00, taxes and shipping included.